In a time of unprecedented pressure, financial services firms are turning to predictive analytics to optimize decision-making and stay ahead of the curve. Click to learn what financial services technology leaders need to know about predictive analytics. Financial services firms are facing unprecedented pressure. Whether they’re struggling to keep pace with technologically savvy customers or competing with aggressive new entrants to the market, there’s no shortage of disruption. Today, incumbents like major banks, insurance companies, and asset management firms are under siege. It’s clearly time to throw out the old playbook. But what should you use in its place? The answer isn’t some one-size-fits-all solution. In fact, for your company to survive — and thrive — in this new world, your solution should be tailored to fit your business and customers. That’s where predictive analytics comes in. Research from Accenture shows that high-performance businesses are five times more likely than their low-performing competitors to view analytical capabilities as core to their business. And a study by EY says that 83% of firms think data is their most valuable strategic asset. However, in the same survey, only 16% of firms considered themselves “excellent” at extracting value from their data. In today’s economy, poor decision-making based on gut feelings can be a fatal mistake. Rather than relying on intuition when making important decisions, top financial services companies are using statistics and machine learning to improve efficiency, reduce risk and increase profits. In a world where the future seems uncertain (at best), predictive analytics can help you know what will happen next so you can be prepared. Because predictive analytics uses your own data, the models and resulting predictions are unique to your company, historical trends, and changes in your business climate. 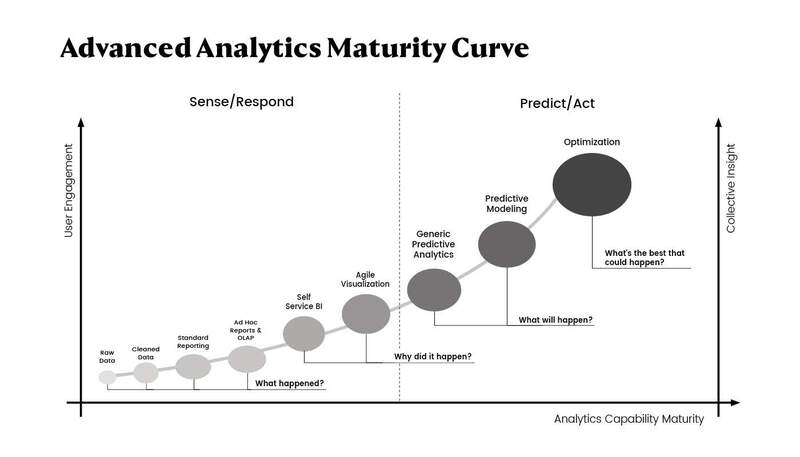 What Can Predictive Analytics Do? Improve Sales Efficiency: Predictive analytics can help create forecasting models that capture relationships between different factors, assess risks, and assigning a score or weight to the risk. Your sales team can use this score to target opportunities with higher scores, allowing your team to focus on the opportunities that are most likely to close. Create a Seamless Customer Experience: Customers are interacting with their financial institution through multiple channels, and the explosion of data can help organizations create better products and more personalized experiences. A predictive marketing perspective can improve the ability to pull consumers in rather than push products out. Anticipate Churn: Each one of your customers is unique, and it’s possible to create models that predict the likelihood of a given customer will part ways with your company. Predictive models can use a variety of data points like the language a customer uses when communicating with you or changes in the way they interact with your digital channels. Armed with this targeted information, you can take preventative measures to retain them and identify trends that are likely to make customers leave. Detect Fraud: Commonwealth Bank uses analytics to predict the likelihood of fraud activity for any given transaction before it’s authorized – within 40 milliseconds of transaction initiation, according to SAS. Identify Compliance Issues: Financial services companies are using predictive analytics to enhance the success rate during the underwriting and credit modeling processes. Knowing the probability that a customer will take a specific action in the future enables companies to make decisions before entering into a risky relationship. Avoid Unexpected Large Expenses: Companies are using advanced analytics to predict the occurrence of extraordinarily expensive events so they can be adequately planned for and avoided. Maximize Resources: It’s not easy to understand where to deploy resources and capital to maximize return on investment. Predictive analytics can be used to identify excess capacity and where to implement it to propel the organization forward. Regulation and data privacy concerns: This is a hot issue right now with the grace period for the GDPR regulations ending. If you service clients in impacted regions, it’s critical to follow the requirements. Predictive analytics requires large datasets, so you may need to be creative in finding ways to developing models that don’t rely on identifiable customer information. Legacy systems make it difficult to introduce new technologies: Disparate systems lacking interoperability make it challenging to set up the necessary tooling to harvest data efficiently. If you fall into this category, it’s an excellent opportunity to create a roadmap for updating your legacy systems as part of your long term strategic roadmap for adopting predictive analytics. It's worth thinking through whether a data warehouse solution would be right for your business. Data readiness: Finding the data is rarely simple for firms with various account structures and naming conventions. For predictive analytics (or any kind of machine learning) to be effective, it’s important to have accurate, complete, and properly labeled data. Don’t worry if a lot of your data is unstructured (text, images or audio). Thanks to advances in image recognition, natural language processing, and audio recognition, predictive analytics models can use unstructured data to inform decision-making. Despite these risks, the risk of inaction is even more significant. In the next 5 years, winners and losers will be determined by their ability to use data analytics. If you’re unsure where to start or how to prepare, we can help. Our advanced analytics team can provide strategy, hands-on engineering, and machine learning expertise. Get in touch.